Random NOTD post for you here, As it has been disgusting and rained all day today, I wanted something summery on my nails to cheer me up so I went for a white base with pink Polka dots - the polka dots aren't perfectly even because I couldn't find my dotting tool so ended up using the head of one of my brothers screwdrivers (Sorry if you're reading this :)). I used Models Own White Nail Varnish on the base, around 2 coats of this gives full coverage I find, and then the dots were done with Rimmel Urban Princess (A great polish, similar to Nails Inc Brompton Place which is one of my all time favourite polishes). 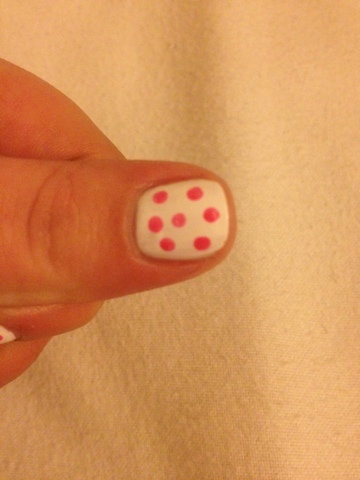 If you have never tried dotting before, you can also use a the end of a Kirby grip to create the dots. I normally put a splodge of nail varnish onto the back of a magazine, or a surface that you don't mind getting nail varnish on, leave a it a few seconds so it goes slightly tacky and then dip the tool you are using for dotting into it and then dot onto the nail. If it is your first time, do a practise run so you know the size of the dots you will get and can then base how many dots you will need on each nail. 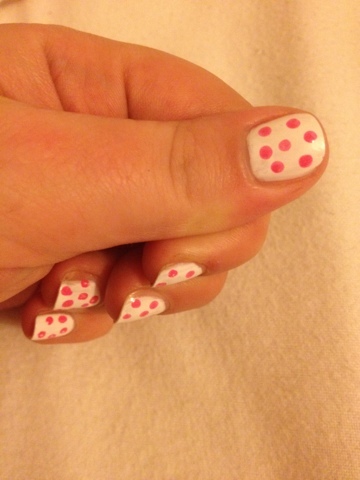 3 comments on "NOTD: Pink Polka Dot Nails"
adroable! 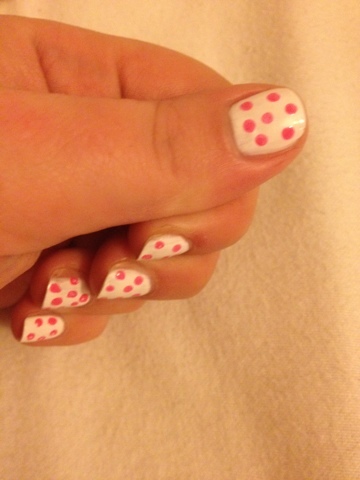 i love polka dot nails! Super cute, I was wearing a similar look this week.